The web part can display videos held within a SharePoint library, stored on a server, or from an http address. 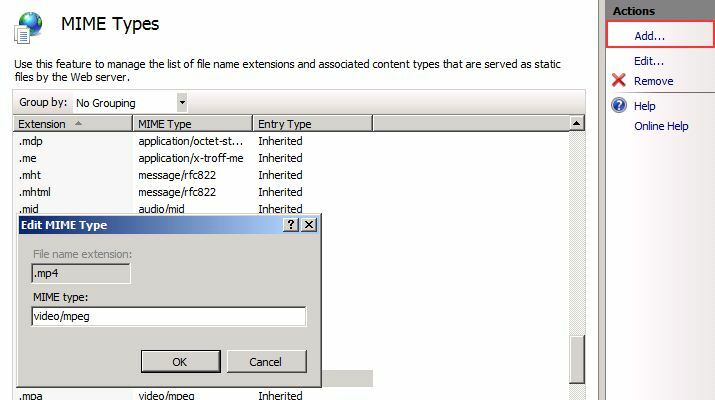 In this post I’m going to cover displaying videos from an http address using IIS 7 on Windows Server 2008 R2. The first step is to create a folder on the web server to hold the videos. Once you’ve done this open IIS Manager, expand the web site you wish to use and create an application to host the media content. Enter an alias and point the application at the folder holding the videos. By default IIS has the MIME type for WMV, but the MIME type for MP4 needs to be added. 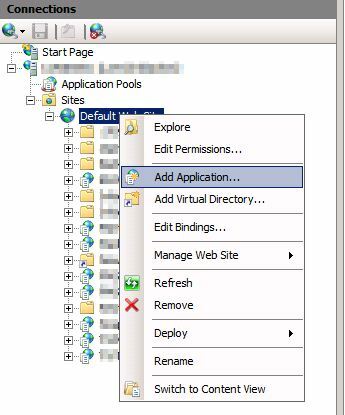 Click on the application you just created, then open MIME types, listed under IIS, in the middle pane. Click Add under actions, enter .mp4 in file name extension and video/mpeg in MIME Type. 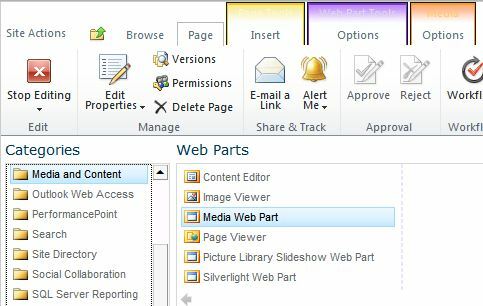 Copy your videos to the folder you created on the web server and add a Media web part to a SharePoint page. Click on the web part to view the configuration options in the ribbon. Click on Change Media and choose From Address. In the address box enter the path to the video, e.g. http://webserver/Media/testvideo.mp4 or http://webserver/Media/testvideo.wmv. When you click play your video will buffer, then begin to play. This entry was posted in SharePoint and tagged Microsoft SharePoint, SharePoint on October 25, 2012 by richardstk. Is there anybody who applied this scenario successfully? Oi Sam, estou experimentando, mas encontrei algumas limitações e pouca informação. A princípio funciona, porém, no chrome (em diferentes sistema operacionais) e windowns 8 ou 10 (e seus respectivos navegadores), os videos não aparecem, dão erro e não podem ser visualizados. Pelo que testei somente internet explorer.